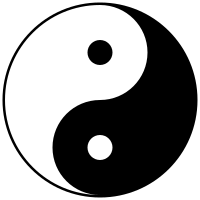 Taoism (modrenly Daoism) is a filosophical, ethical, an releegious tradeetion o Cheenese origin that emphasizes livin in harmony wi the Tao (an aa romanized as Dao). The term Tao means "way", "path" or "principle", an can an aa be foond in Cheenese filosophies an releegions ither than Taoism. In Taoism, however, Tao denotes something that is baith the soorce an the drivin force behind everything that exists. It is ultimately ineffable: "The Tao that can be tauld is nae the eternal Tao." ↑ Laozi. "Tao Te Ching, 1. chapter, translated by Livia Kohn (1993)". Retrieved 29 May 2012. This page wis last eeditit on 4 Februar 2018, at 00:12.